Vaccines Against Measles And Other Diseases Confer Added Protections : Goats and Soda For decades, scientists have observed an extraordinarily positive side effect among children who receive the measles vaccine. Researchers are now finding that other vaccines confer added protections. 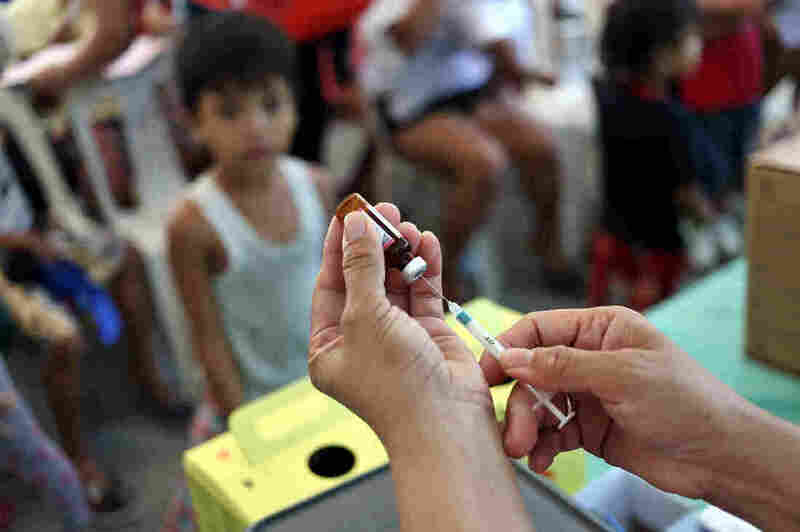 A measles vaccination campaign in Manila, Philippines, this year. The measles vaccine is believed to confer an additional benefit beyond immunity to the measles virus. Vaccinations against other diseases — polio, tuberculosis, typhoid — may also confer an unintended protection. A new study shows that vaccination with a weakened strain of salmonella not only protects against typhoid fever but also seems to rev up the immune system to fight off other problems, like influenza and yeast infection. By chance, in an earlier study looking at how the typhoid oral vaccine affects the gut, researchers noticed that the vaccine also triggered a protective response against influenza. So they designed a new study of 16 adults, reported Feb. 27 in the journal Science Advances, to look specifically at the broader, indirect effects of the vaccine on other infections. "This was the first time anyone looked at typhoid vaccine in this way," says Shaun Pennington of the Liverpool School of Tropical Medicine, who has a Ph.D. in infection and immunity and is an author of the new study. But this small study "fits into a larger story," says Dr. Michael Mina, a pathologist at the Harvard T.H. Chan School of Public Health who studies how measles and the measles vaccine influence the immune system. "Live vaccines have the very broad benefit of going much further than protecting just against the targeted disease." Mina was not involved in the new typhoid study. For decades, scientists have observed an extraordinarily positive side effect among children who receive the measles vaccine: Deaths from measles plummet among vaccinated children, and so do deaths from unrelated diseases like pneumonia and diarrhea. The same result has been found as a consequence of live polio vaccine and bacille Calmette-Guerin, or BCG, vaccine for tuberculosis. When those vaccines are introduced to poor areas of the world, studies have shown, deaths from many other causes, not just the vaccine-targeted disease, go down. In the new study, when researchers introduced bacteria to the blood of vaccinated volunteers in follow-up lab tests, they found increased levels of infection-fighting cells, says Melita Gordon, an author of the study and a professor at the University of Liverpool. About 11 million to 18 million people are infected with typhoid fever every year, according to the World Health Organization, and up to 160,000 people die, most in poor countries. In developing countries, where infectious diseases are common, vaccinating people against typhoid with live salmonella could reduce deaths from a range of diseases, Gordon says. But that's often difficult in poor countries because of a lack of resources and difficulties in transporting and storing live vaccines. Now researchers are trying to figure out why. One theory, unique to measles, was reported by NPR on May 7, 2015. Measles can cause a kind of immune amnesia, erasing the immune system's memory of how to fight off a disease it has previously conquered. So a child who had chickenpox and is therefore immune to it can lose that immunity if he or she contracts measles later. The measles vaccine not only protects against measles — it also protects against immune amnesia. "But immune amnesia is very specific to measles," says Mina. There's another theory that includes other diseases and that could add another layer of protection provided by the measles vaccine, he says. Perhaps the live vaccine trains other kinds of cells to develop a fighting response beyond just the targeted disease. "Maybe for some reason these live vaccines cause epigenic reprogramming — changes in how the cell works at its core," he says. "It would be like sending them to boot camp, making them ready to fight a new pathogen when it shows up." There's a lot more work to be done to understand the mechanism behind the broad-based protection provided by vaccines. But researchers agree that people who choose not to vaccinate their children may be missing out on even more health benefits than previously thought. "This reinforces the benefits of vaccinating kids," says Mina. It adds to a growing realization that "vaccines are benefiting kids even more than we imagined." Susan Brink is a freelance writer who covers health and medicine. She is the author of The Fourth Trimester and the co-author of A Change of Heart.